Although they seem very similar, damp and condensation are different issues and require different solutions. Hence, there is also a significant difference between damp proof paint and anti-condensation paint. It does boil down to the same thing: moisture is either finding a way into your property or cannot find a way out. A healthy property needs to breathe, with good air flow and ventilation. A little dampness and moisture is natural, it’s when the excess has nowhere to go that the problems start. To understand what type of paint you need, damp resistant or condensation resistant, you will first need to understand which of the two issues you are dealing with. Reading the blog on your mobile? Your anti-mould paints can be browsed all in one place. How to tackle damp issues? How can I stop damp returning to wall areas around furnishings? How can I prevent damp build up in a renovated basement? How can I prevent mould and damp on bedroom walls and ceilings? How can I treat damp build-up on skirting boards from concrete floors? How can I treat black mould patches on the wall behind a toilet? What should I use on bare plaster prior to using anti-condensation paint? Are anti-condensation paints the same as waterproofing paints? How can I prevent black mould growing on a kitchen ceiling? Which products can be used to prevent condensation build-up in a caravan or campervan? How can I prevent condensation and mould in the back of kitchen units? What is the best paint for condensation build-up on interior windows? Can anti-condensation paint be painted over? Damp is caused when the building structure is lacking protection from moisture coming from outdoors. This could be a crack in the wall or a damaged roof tile that has been compromised and is letting rain in instead of keeping the rain out. Thus, damp is caused from water or moisture finding its way into your property when it shouldn’t have. Condensation is caused by a lack of ventilation or little movement of air. Condensation is most common in areas with poorer air circulation, such as bathrooms or kitchens. You can tell by your windows and walls whether certain rooms have optimal ventilation. If there is an issue with the air flow, your windows will very easily fog up and you will find droplets forming on your walls and ceilings that will be difficult to get rid off again. Thus, condensation is caused from water not finding its way out of your property. Whether you are dealing with damp or condensation, the implications and resulting issues are similar. Both problems can cause mould to form. Mould thrives in humid, warm environments, and so it loves places that are damp or have condensation. The mould will not just be limited to your walls, but could also spread to your plasterwork, furniture, and clothing. On top of that, mould is detrimental to your health and could cause health issues related to your lungs and airways. If you already have a weakened immune system, mould could create even bigger issues. On top of that, the mould could also create a rather unpleasant odour. The good news is; these are issues that can be tackled! A tell-tale sign for damp is often peeling wallpaper and crumbling plaster. This is a big indicator that there is a source of wetness penetrating your walls and creating problems. Often, this is caused by an external source. For example, a broken roof tile, overflowing gutters, a badly fitted window. Dampness can also crawl its way up, so if you have a badly insulated basement, it’s important to keep an eye on this. You could be dealing with dampness long before you realise, as it could take a while for a damp patch to show on your walls for example. Dampness can usually be smelled before you can see it. So, if you are dealing with a persistent stale and stuffy smell, dampness could be the cause! If you are dealing with some type of leak that is allowing water and moisture in when it should be watertight, a paint like Zinsser Watertite is a great solution for internal usage. This damp resistant paint is designed to keep water out your property, can be applied to wet areas and helps to protect your property from fungal degradation. On top of that, Zinsser Watertite paint comes in a wide variety of colours. If you are dealing with a leaky roof that is letting water in, Rust-Oleum’s Waterproof Roof Paint will be a great solution. This waterproofing paint can also be applied directly to wet areas and in any weather conditions, so it’s perfect for quick repairs. It creates a protective elastic coating that keeps the water out. Both anti-damp paints will help you battle the issues that arise from damp. However, it is still important to ensure you tackle the cause for the dampness as the paint will only help to a certain point. If you are having problems with recurring damp behind shoe storage units in cupboards, chests of drawers or wardrobes, etc, leave the section of furniture out and increase the ventilation to this area (opening windows, doors, etc.) until the patch of plaster/wall surface has completely dried out. Then apply 2 coats of Zinsser Watertite directly to the bare plaster and then decorate as normal. As with all treatment of damp and condensation problems, remove all visible signs of organic growth and treat the areas with Zinsser Mould Killer & Remover in accordance with the manufacturer’s instructions and allow to dry. In painted areas, clean down with Zinsser Universal Degreaser & Cleaner to remove any contaminants. Rinse thoroughly with clean water to remove all residues. Prime all areas with 1 coat of Zinsser B-I-N in accordance with the manufacturer’s instructions and then, apply 2-3 coats of Thermilate InsOpaint Anti-Condensation Paint. For additional protection you can apply a further 1-2 coats of Zinsser Perma-White Interior in your chosen colour and finish if you wish. Use Zinsser B-I-N for covering and sealing the ceiling stains, and then Zinsser Perma-White Interior for the walls. Dampness may be coming up through the floor and into the wall, the skirting boards may be getting damp from the floor and wall. Sealing the wall and floor with a suitable product will hide the problem for a time however the damp is likely to find its way out at some point in time. You would need to remove the skirting boards and treat the surfaces, then re-fix the skirting. Blackfriar Interior Seal Damp is a simple sealer which can be effective in minor damp situations. 2 coats can be applied to both the floor and wall, (in the areas covered by the skirting, not the whole floor/wall). While the skirting boards have been removed these could also be painted on the reverse side with 2 coats of Zinsser Cover Stain followed by 2 coats Zinsser Perma-White Interior. Note the skirting boards must be completely dry before painting. When re-fitting the skirting a small gap could be left between the floor and the boards, this will prevent the skirting from sitting on a damp surface. These should all help but the long-term solution will be to sort out the damp problem. This will be from warm air hitting a cold wall surface behind the toilet and condensing – leaving water droplets on the surface which is then forming mould over time. We would recommend clean surfaces ensuring all existing paint is sound and free of dirt, dust, grease, wax, wallcovering adhesive, soap film, loose paint or other surface contamination. Remove all existing mould and mildew before painting – To do this, Zinsser Mould Killer & Remover directly on to the surface. Leave to dry fully before painting. Prime mould stained areas with Zinsser B-I-N and then apply 2 coats of Zinsser Perma-White Interior in the desired colour and finish. If your exterior is watertight and so the moisture is coming from somewhere indoors, you are dealing with a condensation issue. Condensation is in big part an air circulation issue, where the moisture is unable to leave your property, resulting in droplets on your wall, windows and ceilings and it could also cause spotty mildew. Condensation is most common in rooms such as kitchens and bathrooms, but condensation could also wreak havoc in chimneys or even under your laminate or wooden floors when they are tightly fitted and leave no room for air circulation. A combination of improved heating and air circulation will help solve issues with condensation, and industry experts including Best Heating are on hand to advise you on the best type of installed or portable radiators for short and long-term solutions. There are also various paints designed to work against condensation. A great anti-condensation paint is Thermilate InsOpaint Anti-Condensation Paint. Not only does it come in a variety of colours and in a 5l tin, but this condensation proof paint also works against issues like mould, blistering and cracking paint, discoloured walls, stains and peeling wallpaper. It only takes two coats for this paint to create a thermal insulation and a long-lasting resistance against mould. This paint can be used both on walls as well as ceilings. If you only need a small amount of anti-condensation paint and colour is not important, then Rawlins Paints also stock Coo-Var Anti-Condensation Paint, which only comes in white, but is stocked in 1l and 2.5l tins. This paint also provides protection against condensation and is ideal for smaller projects in bathrooms, kitchens or laundry rooms. Apply 1-2 coats as required of Zinsser Drywall Pro 2 in 1 to the bare plaster and follow with at least 2 coats of Thermilate InsOpaint Anti-Condensation Paint in your chosen colour and finish. Designed for use in areas of high moisture – kitchens and bathrooms – and providing moisture resistant finish, Thermilate InsOpaint anti-condensation paint is not a waterproofing product that will prevent moisture and damp from penetrating the walls from behind. If there is an issue with moisture and damp penetrating the walls under the paint coatings, we recommend using Zinsser Watertite, Sika Damp-proofing Slurry, Sikalastic 1K, or the Sika 1 Waterproofing System. The surfaces where the black mould is present must be thoroughly cleaned – sound and free of dirt, dust, grease, wax, wallcovering adhesive, soap film, loose paint or another surface contamination. To do this, clean surface thoroughly with Zinsser Universal Degreaser & Cleaner or a similar proprietary cleaner. Then spray Zinsser Mould Killer & Remover directly on to the surface. Leave to dry fully before painting. Once prepared, apply 2 coats of Zinsser Perma-White Interior in the desired colour and finish. If the surfaces are interior walls and ceilings that have been previously painted we would recommend that after cleaning and preparation, apply 2-3 coats of Thermilate InsOpaint Anti-Condensation Paint and for added protection add a finishing coat with 1-2 coats of Zinsser Perma-White Interior in your chosen colour and finish. Remove all visible signs of organic growth and treat the areas with Zinsser Mould Killer & Remover in accordance with the manufacturer’s instructions. Allow to dry. Prime all areas to be painted with one coat of Zinsser B-I-N Primer Sealer in accordance with the manufacturer’s instructions. Allow a minimum drying time of 45 minutes in normal drying conditions. Finally apply 2-3 coats as required of Thermilate InsOpaint Anti-Condensation Paint. After cleaning and surface preparation, if you wish to paint the plastered window surrounds then we recommend Thermilate InsOpaint Anti-Condensation Paint. If you wish to paint the window itself – for timber, prime with Zinsser B-I-N, for uPVC prime with Zinsser Bulls Eye 1-2-3. Then finish either primer with Zinsser Perma-White Interior. Yes, if you use Coo-Var Anti-Condensation Paint, but be sure to allow Coo-Var Anti-Condensation Paint to thoroughly dry (5 – 7 days @ 20°C) before applying the wallpaper. Condensation and damp, stains and watermarks are frustrating issues to deal with when they arise. However, don’t despair! There are various solutions that you can carry out yourselves to help minimise the risk of damp and condensation. If you require any further assistance when you are dealing with a damp or condensation problem and would like additional assistance to choose the right products, give our Technical Team a call, or drop us a line, for the latest information on the products available. What would you recommend putting on bare old plaster in a bathroom before using the anti thermilate anti-condensation paint. Thanks for your question and commenting on this post. The answer to your questions is to apply 1-2 coats as required of Zinsser Drywall Pro 2 in 1 to the bare plaster and follow with at least 2 coats of Thermilate InsOpaint Anti-Condensation Paint in your chosen colour and finish. Please let us know if there’s anything else we can help you with today. Is the anti condensation paint textured and does it ontain a water proofing agent ?…I find it dificult to believe that a paint layer of thermolite has sufficient thickness to insulate the wall ? Thermilate InsOpaint Anti-Condensation Paint does have a very slight texture to the finished surface, please see test data attached regarding insulation properties. It is designed for use in areas of high moisture such as kitchens and bathrooms so will provide a moisture resistant finish in its own right but it is not a waterproofing product that will prevent moisture and damp from penetrating the walls from behind. If this is an issue with your project, we can offer solutions for this such as Zinsser Watertite, Sika Damp-proofing Slurry, Sikalastic 1K or the Sika 1 Waterproofing System. I’ve recently had some fitted wardrobes built and the surrounding wall plastered. All of the plaster has dried apart from one large spot of plaster, around 10 inches in diameter, at mid height right next to one section of the wardrobe. I got the wardrobe taken down to investigate and its began to dry out which indicates ventilation issues. Apart from adding air vents how should I treat the damp spot to stop any recurrence when the wardrobes are put back? Thanks for reading our blog, and for your question. To answer your question – leave the section of wardrobe out and increase ventilation (opening windows, doors, etc.) until the patch of plaster has completely dried out. Then apply 2 coats of Zinsser Watertite directly to the bare plaster and then decorate as normal. I have a kitchen with a condensation/black mould issue. The paint in the kitchen ceiling has flaked off and so could you advise what is the best paint to use for the ceiling. Anti damp paint was originally used which looks like it has stayed on ok, but the acrylic paint which was painted over has completely flaked off. Any advice would be much appreciated. Under the kitchen sink units are black mould too and so am looking to add ventilation as well as use the correct paints. All advice is much appreciated thank you. Thank-you for replying to this post. To answer you question – Surfaces must be clean, sound and free of dirt, dust, grease, wax, wallcovering adhesive, soap film, loose paint or other surface contamination. Remove all existing mould and mildew before painting – To do this, clean surface thoroughly with Zinsser Universal Degreaser & Cleaner or a similar proprietary cleaner. Then spray Zinsser Mould Killer & Remover directly on to the surface. Leave to dry fully before painting. Once prepared, apply 2 coats of Zinsser Perma-White Interior in the desired colour and finish. Hi Ali, thanks for your question. Coo-Var Anti-Damp Paint is a white, special low odour, efflorescence resistant resin based paint for application to damp interior walls and ceilings. Designed as a primer coat containing an active reagent which combines with surface moisture and dampness. Contains a biocidal product for the preservation of the dry film and discolouration reduction. Can be applied to plaster, cement and stone even when the surface is damp (not saturated) and can be overcoated with ordinary decorative paints. NOTE: This paint will not cure the cause of dampness. Would I be able to use this as a surface coating for inside a campervan please? I’m planning on having vents. Just want to aire on the side of caution and not end up with mildew. Any help would be appreciated. Assuming the surfaces you wish to protect are interior walls and ceilings that have been previously painted we would recommend using Thermilate InsOpaint Anti-Condensation Paint. After cleaning and preparation apply 2-3 coats of Thermilate InsOpaint Anti-Condensation Paint and for added protection finish with 1-2 coats of Zinsser Perma-White Interior in your chosen colour and finish. If there’s anything else we can help you with, please don’t hesitate to contact us, Anna. Each paint will have a datasheet available for it on the product page, and our technical support line is open during regular office hours. Hi I have condensation/damp in my basement bedroom….specially inside the built-in wardrobes….would it help if I painted then with ani damp paint? And if so which paint do you reccomend? Im quite desperate as my 3 year old and my 6 month old sleep in the same bedroom and I think it is affecting them. Remove all visible signs of organic growth and treat the areas with Zinsser Mould Killer & Remover in accordance with the manufacturer’s instructions and allow to dry. In areas with remaining sound paint clean down with Zinsser Universal Degreaser & Cleaner to remove any contaminants. Rinse thoroughly with clean water to remove all residues. Prime all areas with 1 coat of Zinsser B-I-N in accordance with the manufacturer’s instructions and then, apply 2-3 coats of Thermilate InsOpaint Anti-Condensation Paint. For additional protection you can apply a further 1-2 coats of Zinsser Perma-White Interior in your chosen colour and finish if you wish. We have an ordinary internal room that we advised may benefit from anticondensation measures to help mitigate a possible condensation problem in the roof. Therefore rather than the standard white emulsion on the ceiling, if we painted your anticondensation paint would that provide a type of “vapour barrier” to minimise the amount of moist internal air entering the roof space. 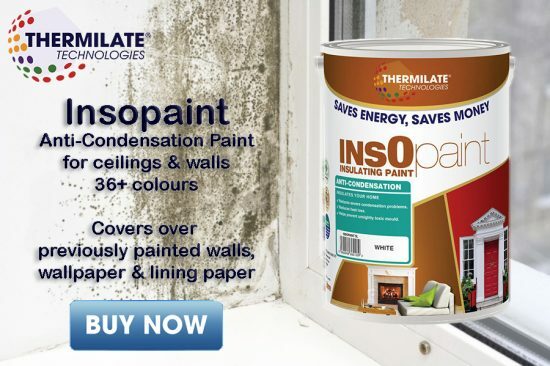 Thermilate InsOpaint Anti-Condensation Paint is a specially developed insulating paint designed to be applied in 2-3 coats to surfaces to provide a thermal layer which in turn will help deflect heat back into the room and cold back out. It helps reduce condensation and in turn mould and mildew by marginally raising the temperature of the surfaces it is applied to so warm/hot air doesn’t come into contact with very cold walls and ceilings creating condensation. In areas of high humidity and moisture such as swimming pool enclosures we would recommend Thermilate InsOpaint Anti-Condensation Paint is overcoated with Zinsser Perma-White Interior for additional protection and durability. If there is anything else we can help you with, please do let us know. Can your Insopaint anti condensation product be used on the back of kitchen units which are plywood. The units are only 2 years since installation but black mould is showing at the back of the cupboards and draws. The walls in the kitchen are single brick. The old internal rendering and plaster was removed and re rendered with a slurry then re plastered prior to the fitting of the kitchen. Remove all visible signs of organic growth and treat the areas with Zinsser Mould Killer & Remover in accordance with the manufacturer’s instructions. Allow to dry. Prime all areas to be painted with one coat of Zinsser B-I-N Primer Sealer in accordance with the manufacturer’s instructions. Allow a minimum drying time of 45 minutes in normal drying conditions. Finally apply 2-3 coats as required of Thermilate InsOpaint Anti-Condensation Paint. If there is anything else we can help you with today, please do let us know. Is it the 1902 Anti Damp Paint which you are using? If it is this product, then yes, you can paint over it with normal emulsions. If it is not this product, or products available on Rawlins Paints, then we cannot completely advise you on whether they can be painted over – as different paints will have differing overcoating recommendations. Is there anything else we can help you with on this project? It sounds like a condensation issue (see the condensation section above, which details similar issues with moisture on windows and water droplets around the frame and surrounding walls). Hi, we have a top floor flat with a flag roof by the sea. The flats suffers from condensation and we’d ventilate the bedroom. However the far external wall has a damp patch that appears in the top corner and it dries out most morning, despite getting the cavity wall insulation topped up. What do you suggest to redecorate with? Improving the ventilation would be our first recommendation. If this cannot be done for any reason or is done and still doesn’t rectify the issue then the following options could help. •	If moisture is coming through from outside then something like Blackfriar Interior Seal Damp could be tried but this will seal the wall and could make the condensation worse. •	If you want a moisture resistant paint for the interior walls then Zinsser Perma-White Interior would be a good choice. Provided the plaster is completely dry, apply 2 coats Perma-White. This won’t stop the condensation but will prevent this soaking into the wall and ceiling. •	For a completely breathable coating you could apply Zinsser Grade 1 to the walls and ceiling. This will allow the condensation to pass through into the plaster. •	Finally, apply 3 coats of Thermilate InsOpaint Anti-Condensation Paint would help seal the wall and improve the surface temperature reducing the likelihood of condensation forming in the first place in that area. What is the best paint for interior windows which suffer from condensation? After cleaning and preparation as explained in the above blog post, if you wish to paint the plastered window surrounds then we recommend Thermilate InsOpaint Anti-Condensation Paint. If you wish to paint the window itself – for timber, prime with Zinsser B-I-N, for uPVC prime with Zinsser Bulls Eye 1-2-3. Then finish either primer with Zinsser Perma-White Interior. I’ve had new Windows fitted which have trickle vents, yet mould is still growing in patches around the ceiling, window and walls of my bedroom. Should I use anti damp paint or anti condensation paint? We would recommend a mould resistant paint for this. I’m baffled with a damp problem in one corner of my conservatory. One corner shows damp through the paint under the roof section. I’ve taken damp meter readings which showed high and drew a line around the damp area affected. It has been like it for at least 3yrs even during hot summers, little rain with windows and doors open the paint has stayed wet, the affected has neither increased or shrunk in size! Ok, now here’s the baffling part, with a Stanley knife I cut a 6 inch square in the paint in two places in the affected area and peeled the paint off ( approx 3 coats thick) to bare plaster below, tested it with the moisture meter and it was bone dry!!?? Any ideas what can be causing this weird situation? Without an industry professional carrying out a survey on the property we really have no way of knowing what exactly is causing this but from the situation you have explained it sounds like it may be condensation sitting on the surface of the paint in that area making just the exposed surface wet or it could be something as simple as a stain on the paint that looks like a damp patch. As a test to eliminate some possibilities I would suggest preparing the area by cleaning down, ensuring all existing paint is well adhered and removing any that isn’t and feathering back to a sound edge. Prime bare areas of plaster with Zinsser Bulls Eye 1-2-3 Plus, then apply 2 – 3 coats of Coo-Var Anti-Condensation Paint, then redecorate the area to bring it back into the colour scheme as required. You can then monitor this area, if the issues re-occurs we know it needs further investigation in person, by a local specialist. I have a problem of damp coming through an unused chimney breast. The chimney only goes into the loft not through the roof . Any ideas please ? This is a tricky question to answer, as there can be numerous sources of damp and it is recommended to get a professional to inspect the chimney for damage. The products listed in this post will help deal with the internal damp – but the problems with the chimney are bigger than these products can handle – and may be covered in the rising damp post. Is the chimney on an external wall or adjoining property? As the issue could be there. If you’ve more details, please let me know. We have a small bathroom with a small window which I think is causing condensation issues. Occasionally we’ll find a layer of water across the walls, floor and windows (seems to always be in the evening/night) and the corners of the room / windows / ceiling have a small amount of black mould which keeps returning – we are assuming is a condensation issue. After reading your blog and comments we were looking to purchase the Thermilate InsOpaint Anti-Condensation Paint you recommend, but can we paint this directly on to the walls / ceiling on top of the existing paint? The paint used on the ceiling is now cracking and peeling, allowing mould to form in the cracks. We’d like to paint 2-3 coats on all walls and ceiling, but should we then cover with Zinsser Perma-White Interior? The bathroom gets very wet everytime we have a shower so want to find a good way to protect the walls before it gets any worse. What you have suggested would be ideal after you’ve carried out the preparation explained in the How to Paint Over Mould blog post (obviously don’t apply the Zinsser Perma-White Interior from this blog post as you’ll be doing that at the end after the Thermilate product in your case). Apply 2 – 3 coats of Thermilate InsOpaint Anti-Condensation Paint followed by 2 coats of Zinsser Perma-White Interior (use Satin finish not Matt) in your chosen colour. Hi we have a similar problem but without mould. I’ve already painted our bathroom with Zinsser Primer 123 on to bare skim plaster then 2 coats of perma-white interior Matt. We seem to get a lot of condensation watermarks on the wall after a shower. Should I buy and apply your thermal condensation paint over the already painted walls then apply perma-white Satin? Or can I just apply perma-white Satin over the perma-white Matt? Will the Satin hide the water drop marks? Thermilate (thermal condensation) products aren’t advised for the situation you describe. Using Zinsser Perma-White Interior in the Satin finish would certainly make the surface easier to clean/wipe down to remove the streaks, but wouldn’t make the surface resistant to water drops from steam sources in the bathroom. I’m sorry if this doesn’t completely remove the condensation issue you’re encountering, but it will provide a durable surface that is easy to wipe clean of water residue from steam – making it a more manageable solution that won’t discolour or affect the underlying substrate or undercoats. I have to tackle the area behind my kitchen sink unit which is of single brick construction and suffers from condensation and resulting black mould. I intend to clean off the black mould, but am unsure which of your products to use after that. The anti-condensation paint would seem to be most appropriate. Should I use this this on its own or in conjunction with Zinsser Perma-White? In answer to your question, using the Perma-White as well would be best. Please don’t hesitate to contact us for further information and advice. I HAVE A LARGE METAL SHED TYPE OVERHANG ALONG SIDE MY METAL BUILDING. IT IS ABOUT 10 FEET HIGH, 25 FEET WIDE AND 50 FEET LONG. IT IS OPEN AT BOTH ENDS AND IS BUILT OVER A CONCRETE SLAB. I HAVE AN OCCASIONAL PROBLEM WITH CONDENSATION……CAN ONE OF YOUR PRODUCTS BE SPRAYED ON THE UNDERSIDE OF THE SHEET METAL ROOF? I AM NOT CONCERNED ABOUT COLOR OR APPEARANCE. I have 2 older sliding glass doors in my living room. They do need to be replaced, but I’m not in a position right now to do that. Down at the bottom I get frost in the winter and the paint near each side of the doors has started to blister and flake. Will the anti-damp paint prevent this from happening? The issue outlined does sounds like a damp issue, rather than a condensation problem. For this, we would recommend Zinsser Watertite. Zinsser Watertite is a waterproofing paint that is guaranteed to keep water out and contains a biocide that protects the dried coating against fungal degradation for a minimum of 5 years. Unlike other waterproofers, Zinsser Watertite waterproofing paint can be applied to dry, damp or wet surfaces, so water problems can be cured immediately. It can be recoated in just four hours and dries to a smooth, bright white, non-yellowing finish that resists dirt and dust pick-up. If there are any other questions you have about this recommended product or the area of damp around the sliding glass doors, do please let us know. Just brought a property with a single skin brickwork bathroom downstairs and no ventilation. There is no damp, however there is a condensation problem and mould. What do you recommend to rid of the condensation and mould and how to do this, and what paint/s thereafter to protect against condensation and mould in future? Thanks for your question. As highlighted in the article, under “How to tackle condensation?”, the product recommendations would be Thermilate InsOpaint Anti-Condensation Paint or Coo-Var Anti-Condensation Paint (which is only available in white). Hi there, we have a top floor flat and have awful condensation issues on our north-facing living room wall, mainly in the colder months. We keep the flat well ventilated (and we have a dehumidifier) but the real problem is that the wall is very cold to the touch and also we have a flat roof above the ceiling, so the room/ceiling loses a huge amount of heat and of course triggers condensation. I am going to redecorate during the warmer months, and I will use an insulating wallpaper liner on the walls before painting. Can you recommend the best paint for the ceiling? I need something that can withstand the fluctuating temperatures and is moisture resistant. I was even considering using a paint designed for exterior walls. Previously, I have touched-up the paint in the worst corners of the ceiling, and the paint has peeled off shortly after. I am worried the whole ceiling will start peeling if I choose the wrong paint! Ensure that the surfaces to paint are thoroughly prepared – i.e. thoroughly cleaned (using a fungicidal solution if necessary), removing ALL loose and flaking existing paints, etc. After cleaning and preparation apply 2-3 coats of Thermilate InsOpaint Anti-Condensation Paint and for added protection finish with 1-2 coats of Zinsser Perma-White Interior in your chosen colour and finish. Do let us know how you get on and if there’s anything else we can help you with. Any advice please for a minor damp problem. Interior bedroom wall shows minor damp patch (light yellow/brown) only behind one picture frame near to an opening window. The existing paint is not flaking or peeling. It is an exterior wall NW facing. The flat is third floor so without an extensive external inspection we can’t fix any exterior problem right now (we will when external decorating is due). After cleaning the patch it is now a very light yellow. The room is well ventilated. We will be decorating all the walls with 2 coats of Vinyl Silk. We’d recommend Blackfriar Interior Seal Damp for this (https://www.rawlinspaints.com/home/hygiene-coatings/mould-damp-proof-paints/694-blackfriar-interior-seal-damp.html). Hi, I have a built-in wardrobe, completely interior .. the back is the wall of the laundry, which in turn is interior, and the doors are in the small area outside my bedroom. I have washed it, painted the walls (drywall), put perfumed hanging airfresheners, but it smell funny, and my clothes get the smell of damp and have to be re-washed. I live in a warm place, leave wardrobe doirs open quite a bit, have a dehumidifier, use a silicate dehumidifier on the shelves, and even my boots have gone mouldy! What should I paint it with,mand would it get rid of the smell? We would suggest that, after cleaning with a fungicidal solution, that you prime the surface with Zinsser B-I-N and then apply 2-3 coats of Thermilate InsOpaint Anti-Condensation Paint. Please don’t hesitate to contact us if there’s anything else we can you help you with. If i use Condensation paint on a bedroom wall by a window can i wallpaper over it. Hi Mark, I see you are very helpful to a LOT of people. I am hoping you will help me, too. The external walls in two of the three bedrooms have started to show small water spots (not wet to the touch, but I think it’s damp spots) quite evenly spaces across the whole surface. This makes me think the water is seeping in through the old brick walls. Could it also be coming through the roof? I’ve had it fixed supposedly but wanted to check. Sealing the outisde of the house is an expensive long term project, but for the interim, which paint is best to use inside the bedroom? I would probably use Magnolia if I could, or white if that’s not possible. As a temporary solution, the Coo-Var Anti-Damp Paint should be suitable for these internal areas (walls and ceilings) – there’s more information on the product datasheet – here. It’s available in white, here. It can be overcoated too, if you choose to go for a magnolia finish later, after resolving if the issue is from the roof or outside walls. If you’ve any other questions, do let us know here, or on our Facebook page. Hi, one of our bedrooms is North facing with two exterior walls. We think we have both damp & condensation problems. There are two fairly large patches of damp on the ceiling (lightly artexed) and mould on wall paper. We have removed the wallpaper and there is no mould on the walls behind it. We have also had our roof repaired which should help. Would you please advise which products to use to cover the marks on the ceiling and help prevent mould growth when we redecorate? Thank you . Is there anything else we can help you with today? Don’t forget that you can follow us on Facebook, here, too. Without knowing what the type of metal the roof is it’s hard to advise – but one of our most popular exterior metal roof/cladding coatings at this time of year is Rust-Oleum Mathys Noxyde Pegarust. If you download the TDS (Technical Data Sheet) from the ‘DATASHEETS tab on the product page you will find advice here on preparation and priming. Yes, preparation information and primer recommendations can be found in the TDS previously referred to. We have condensation on th back stairs of our flat. We are having it skimmed shortly and we have been advised to put a waterered down mist coat of emulsion on before applying a coloursed emulsion on top. My question is if i would put the condensation paint on first before the mist coat or would the condensation paint do the same job as the mist coat? The sealer coat needs to be applied to the new plaster as advised by your plasterer, then once on and all is dry you can finish with your choice of Anti-Condensation Paint. I had recently installed a built in cupboard to one of the alcoves in the bedroom, which is an outside wall. After a few weeks there was mould all over the back panel. I’ve taken the cupboard out. The wall although not wet had mouldy patches and slight damp where the skirting board was. There was no ventilation into the cupboard. The wall surface is prepainted. The windows in the room usually gets wet when it’s a cold day. What is the best thing to do before I fit the cupboard back to the wall? Your suggestions will be most welcome. Thanks for your message. In answer to it, we would suggest that after cleaning with a fungicidal solution, that you prime the surface with Zinsser B-I-N and then apply 2-3 coats of Thermilate InsOpaint Anti-Condensation Paint. Have a good Christmas and New Year, Abi. Hi, have just had new skirting boards added to a basement room. A small amount of damp comes from underneath (despite best efforts to solve the source) and has started to mark the wood. What are the best gloss products to prime and paint the skirting with to try and reduce the probable long term effects? There isn’t a long term solution to this as far as a paint system is concerned. Assuming it is a concrete floor with plastered walls, dampness may be coming up through the floor and into the wall, the skirting boards may be getting damp from the floor and wall. Sealing the wall and floor with a suitable product will hide the problem for a time however the damp is likely to find its way out at some point in time. You would need to remove the skirting boards and treat the surfaces, then re-fix the skirting. Blackfriar Interior Seal Damp is a simple sealer which can be effective in minor damp situations. 2 coats can be applied to both the floor and wall, (in the areas covered by the skirting, not the whole floor/wall). While the skirting boards have been removed these could also be painted on the reverse side with 2 coats of Zinsser Cover Stain followed by 2 coats Zinsser Perma-White Interior. These should all help but the long term solution will be to sort out the damp problem. Hi, we have a 30s solid brick house. In one room we have a wet spot about a metre and a half up the wall. I found this sport after removing a built in wardrobe. I think it may be a slight crack in the white rendered wall outside. I am considering painting the wall thinking that should be good enough to seal any cracks. The internal wall has hairline cracks in the plaster. I put a dehumidifier int he room and it drew nearly two litres of water in a day. The wall is now dry so I would like it to paint it. What do you think about the possible cause of the wet? We would advise using Rust-Oleum Mathys Murfill Waterproofing Coating for the external, assuming the exterior crack was the source of the incoming damp, once the interior wall surface is dry they can paint with Zinsser B-I-N followed by Perma-White. Treat the mould thoroughly, ensure the walls are completely dry then apply 2 coats of Zinsser Grade 1. As well as an extractor fan, ventilating the room after using the shower etc will keep condensation to a minimum. I tried to submit a previous message, no idea if it went through because apparently I am a robot! I am looking for advice on whether I am have damp or condensation and of course what to do about it. I have a black spotty patch on the wall behind my toilet in my bathroom. I am not sure if it’s damp or condensation – I have a well ventilated bathroom with an air-vent, extractor fan and a window (single-glazed) and so I am leaning towards it being damp. Although again, I am unaware of any exterior issues that could be causing moisture to enter the bathroom. Any suggestions on how to determine which it is? Which do you think I have? And what do you suggest I do about it? It sounds like this will be warm air hitting a cold wall surface behind your toilet and condensing – leaving water droplets on the surface which is then forming mould over time. We would recommend clean surfaces ensuring all existing paint is sound and free of dirt, dust, grease, wax, wallcovering adhesive, soap film, loose paint or other surface contamination. Remove all existing mould and mildew before painting – To do this, Zinsser Mould Killer & Remover (here) directly on to the surface. Leave to dry fully before painting. Prime mould stained areas with Zinsser B-I-N (here) and then apply 2 coats of Zinsser Perma-White Interior in the desired colour and finish. Please let us know on here, or our Facebook page, if there’s anything else we can help you with. Can you recommend a suitable paint for this and do you think this will solve my problem ? To help resolve the issues you’re having with these areas we would recommend using Thermilate InsOpaint Anti-Condensation Paint internally and Zinsser Perma-White Exterior externally. Both products are available to order right now on our site, links contained above to the product pages. For this we would advise Zinsser Perma-White Interior. It will take to the Gardz and can be used on both surfaces, wood and plasterboard to provide a durable, non yellowing mould resistant coating. Clean and apply 1 coat of Coo-Var Acrylic Primer Sealer Undercoat (Coo-Var Water Based All Metals Primer to any areas of bare metal) Then apply 3 coats of Coo-Var Anti-Condensation Paint. Please let us know if there is anything else we can help you with, and don’t forget you can stay in contact with us on Facebook or LinkedIn, too. I’m just about to take over a small commercial space in a converted Victorian brick-built building. It may be that there is no DPC in place, or the footpath outside the building is built up above the DPC … either way, there is evidence of either rising or penetration damp in the lower part of spme of the walls which is causing paint peeling – somewhat unsightly. Because it’s a shared workspace in a council-owned property, my options for tacking the root cause are limited so I am left with cosmetic solutions. Is there a paint that I can apply to the affected areas that will at least not require renewal too regularly? Coo-Var looks like it might do the job, it’s also referenced in a thread higher up this forum. You’re right, we recommend Coo-Var Anti-Damp paint for this task – which is available here: https://www.rawlinspaints.com/home/hygiene-coatings/mould-damp-proof-paints/520-coo-var-anti-damp-paint.html It will meet all the requirements you’ve outlined. Could you confirm that Zinsser Watertite can be applied to plaster/skim etc ? Watertite cannot be applied to plaster, it is only suitable for masonry surfaces such as render, concrete, bricks etc. If you contact our Technical Support Team at [email protected] with some more details of what you require, they may be able to recommend a suitable product for you. I live in a ground floor converted flat which has ongoing damp issues. In the bedroom we have a big bay window which is north facing and the walls are ice cold and damp to touch at this time of year even with the heating and dehumidifier on. I have had extra air bricks and cavity cleared to help air circulation however I have used Zinsser watertite on advise from a builder but i feel that this has exacerbated the condensation problems as now the walls wont allow any moisture to escape. I am at the point of thinking it would be best to strip all the plaster off and start again as I have a 6 month old son who is sleeping in that room too and there is mold growing on all the furniture i need to find a solution to try and resolve this issue. Any advise you could give me regarding products or in general would be greatly appreciated. Having read through the information you have provided, we don’t feel that removing the plaster would necessarily resolve the issue. 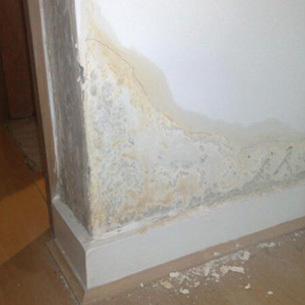 Typically when mould is forming, this is caused by condensation and not rising damp / ground water. Our recommendation would be to speak to a ventilation expert regarding the matter, however as a short-term fix, after cleaning and preparing the walls you could apply Thermilate InsOpaint Anti-Condensation Paint followed by Zinsser Perma-White Interior. We have green mould growing up from the skirting (in one corner mainly) of bedroom wall (which is a cold outside wall). Have tried a bleach solution and small dehumidifier – which have helped – but would like to try something else esp. as bleach has discoloured the paint anyhow! Wall currently has matt white paint coating so would like something compatible with that and that will give that finish so we don’t have to redecorate the whole room, just that wall. What would you recommend also bearing in mind it’s a bedroom so nothing too toxic in terms of fungicides – though I appreciate mould isn’t that good for your health either! Please let us know if there is anything else we can help you with – all product recommendations above link to the products on our store, too. Victorian house with fitted wardrobes on exterior walls. Walls inside the wardrobes have insulating paper on them and are also painted but mould from condensation has developed on the exterior corners. I appreciate I need to strip the walls of existing paper and increase ventilation. Once that is done what would you suggest? I don’t particulate want to leave the walls as bare plaster. Can I paper it again with insulating paper or tiles (which would be easier to fit as the space is tight) and use your products too? Thank-you for your question. As discussed in the post, we would recommend Zinsser Watertite for bare plaster – which can then have new wallpaper applied over it. Please let us know if there is anything else we can help you with via this post, email or on our Facebook page.